When your child attends a Montessori school, he or she is in good company. According to a 2016 study, over 5,000 schools in the U.S. use the Montessori method — giving your child many educational and personal advantages that will last a lifetime. But what does that advantage look like on a daily basis, as your child learns and grows in the Montessori environment? 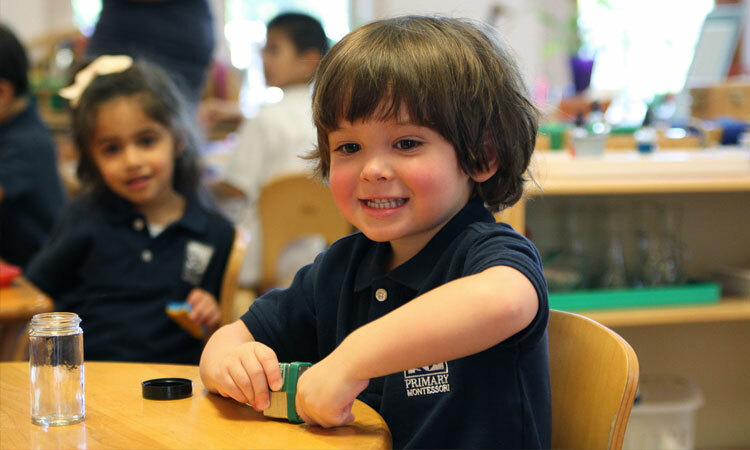 Here’s a look at a typical child enjoying a typical day here at Primary Montessori. Little Jane is greeted at the door by a teacher. She takes off her coat, hangs it up, and sits with the other students, excited for school to begin. Jane is invited to begin her activities. Excited, she chooses a puzzle and fits the pieces together, building hand-eye coordination and her ability to recognize shapes and sizes. Like many students, Jane grows a bit restless during mid-morning, something Maria Montessori referred to as “false fatigue.” Fortunately, Jane’s teachers know just want to do. They calmly encourage Jane to continue her puzzle, helping her to settle back to work with ease. Older students mingle in the classroom, helping younger students. Mary sees Jane with her puzzle and comes over. Using the puzzle pieces, she helps Jane practice counting and simple addition. Before lunch begins, everyone takes care of the classroom environment. Jane happily gathers the puzzle pieces she has assembled and returns them to their storage place. Jane heads to the sink to wash her hands before lunch, reminded of the value of taking care of herself properly. After lunch, Jane and two other students, William and Dawn, help each other to find flowers in bloom. They share crayons, draw the flowers they have seen, watch bees land on the flowers, and then clean up to head back inside. Back inside the classroom, Jane and the other students gather to practice reading. They also share their favorite parts of the story. Everyone takes turns speaking, practicing their social skills in a warm, safe, encouraging environment. After an invigorating day full of learning opportunities, social interactions, indoor/outdoor exploration and practical life experiences, Jane is ready to head home with her parents — a big smile on her face! We invite you to see for yourself what your child will enjoy every day at Primary Montessori. Visit our reviews page to see why parents and students love our school, and contact us anytime to schedule a tour. We are looking forward to meeting you and your child, and answering any questions you have about a Montessori education.